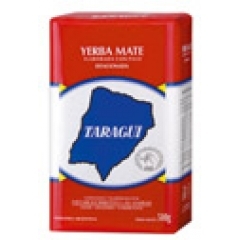 Taragui Classic con palo Yerba Mate. 1kg..
Home > Coffee/Tea > Taragui Classic con palo Yerba Mate. 1kg.. The original !! This is our classic blend of the finest yerba mate and stems. Rich and exotic flavours of South America. 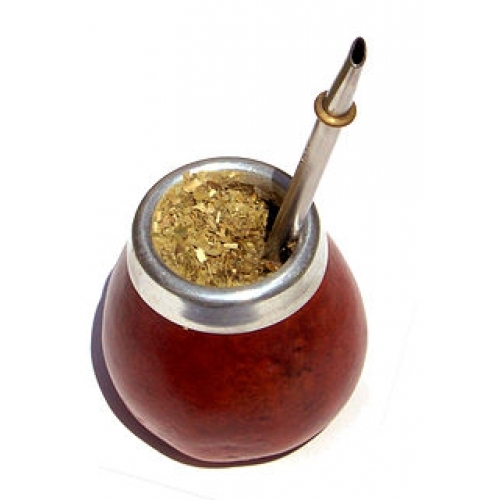 Mate, Yerba mate (also spelled Yerva mate) or Erva mate (Spanish: yerba mate, Portuguese: erva-mate), Ilex paraguariensis, is a species of holly (familyAquifoliaceae) native to subtropical South America in northeastern Argentina,Bolivia, southern Brazil, Uruguay and Paraguay. It was first used and cultivated by the Guaraní people, also in some Tupí people communities in Southern Brazil, prior to the European colonization. It was scientifically classified by the Swiss botanist Moses Bertoni, who settled in Paraguay in 1895. 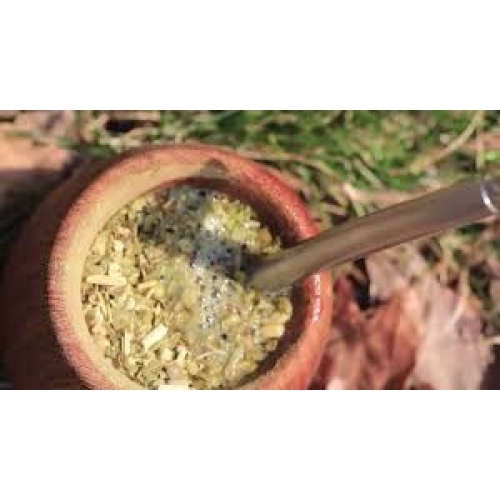 The infusion called mate or chimarrão (Brazil) is prepared by steeping dry leaves (and twigs) of the mate plant in hot water, rather than in boiling water. 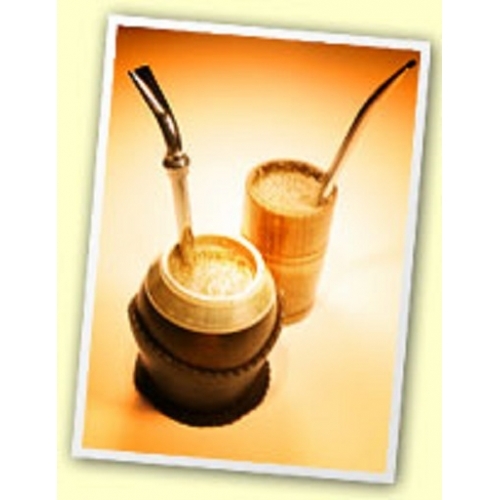 Drinking mate with friends from a shared hollow gourd (also called a guampa or mate in Spanish, or cabaça or cuiain Portuguese, or zucca in Italian) with a metal straw (a bombilla in Spanish, bomba in Portuguese) is a common social practice in Argentina and southern Brazil among people of all ages; the beverage is also very popular in Uruguay, Paraguay, Peru and Chile, eastern Bolivia and other states of Brazil, and has been cultivated in Syria, Lebanon andJordan. The flavor of brewed mate is strongly vegetal, herbal, and grassy, reminiscent of some varieties of green tea. Some consider the flavor to be very agreeable, but it is generally bitter if steeped in boiling water. The mate plant is a shrub or small tree growing up to 15 meters tall. The leavesare evergreen, 7–11 cm long and 3–5.5 cm wide, with a serrated margin. Theflowers are small, greenish-white, with four petals. The fruit is a red drupe 4–6 mm in diameter. The leaves, popularly called "herb" (Spanish: yerba, Portuguese:erva) contain caffeine and related compounds, and are harvested commercially.